If you have been reading our blog for a while now, you know we love biking. We do it on a daily basis and encourage our kids from a young age to ride. So far (knock on wood), they have taken to biking well and share our love for it as a family. 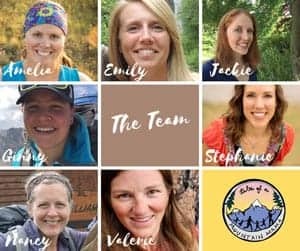 Our rides are daily around our neighborhood (both paved roads and dirt trails) and less often on roads for further distances or more technical trails. As we have looked at a variety of bikes, our biggest challenge has always been the fact that kid bikes in the U.S. in general are really heavy in relation to the size of the child. Most people just write it off as just the way things are and take hold of the motto, “it will just make them stronger”. Often children are put on whatever bike their parents can get ahold of and, unfortunately, in many cases are battling a bike that is too heavy, too big (“they’ll grow into it”), and/or with poor geometry. Parents are certainly well-meaning and just want to get their child riding – we get that! While there have been many a child that learned to ride on a “clunker” and succeeded in excelling and teaching themselves, the obstacles are maybe just not necessary. For a child just learning to ride, finding success and mastery of their new-found skill can be a little sensitive. If they are not only learning to ride, but also their bike is working against them, the process can be very frustrating for all involved. Our boys have been on some great bikes over the past few years, but are now completely spoiled (or maybe that’s me?) by WOOM bikes. 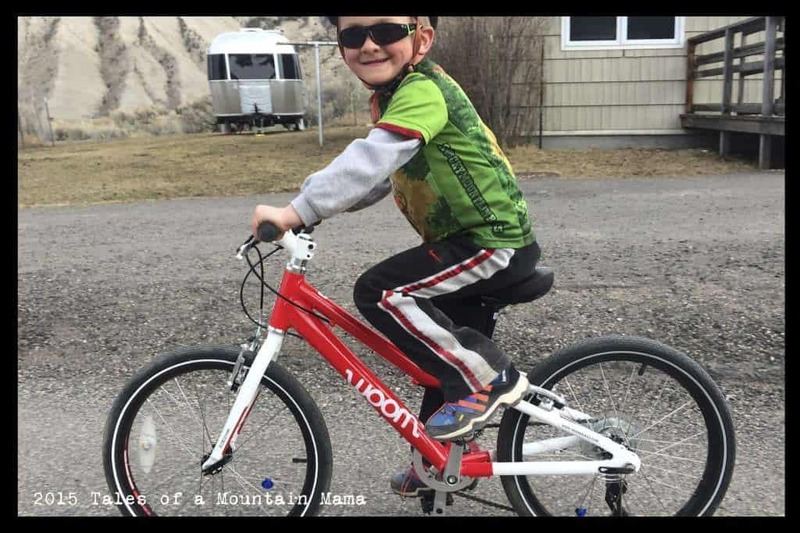 Based out of Austria, and brand new to the United States, WOOM bikes are lightweight bikes built specifically for kids with quality components and impressive geometry. The bikes went through literally years of building and testing before they were released in Europe in 2013. The result is some of the very best kid bikes you can buy. To be honest, I was a little skeptical as to whether a few pounds would make much of a difference for either one of our boys. They learned to ride on quality, albeit heavy, bikes and I figured that was good enough. However, I was blown away by the immediate differences we saw in their riding up some impressive hills here in Mammoth Hot Springs. What once was a whine-fest became do-able and nearly easy. The focus was turned from the bike and their struggles to propel it to the actual ride and the world around them. This is huge for us. While our family doesn’t feel the need to have the very best of everything (which is good, especially for our pocketbook), we have a brand new appreciation for the value of quality bikes for kids that lets them ride instead of wrestling against an almost impossible load to push. There are no good quality suspension shocks available for 20 and 24″ bikes on the market. In fact, a good and quality suspension shock for adults costs at least $400. There will be no market for a kids bike with a fork that expensive. In turn, manufacturers offer low quality and poor performing shocks on children’s bikes with the hopes of “tricking the customer” into thinking that it’s a good choice. 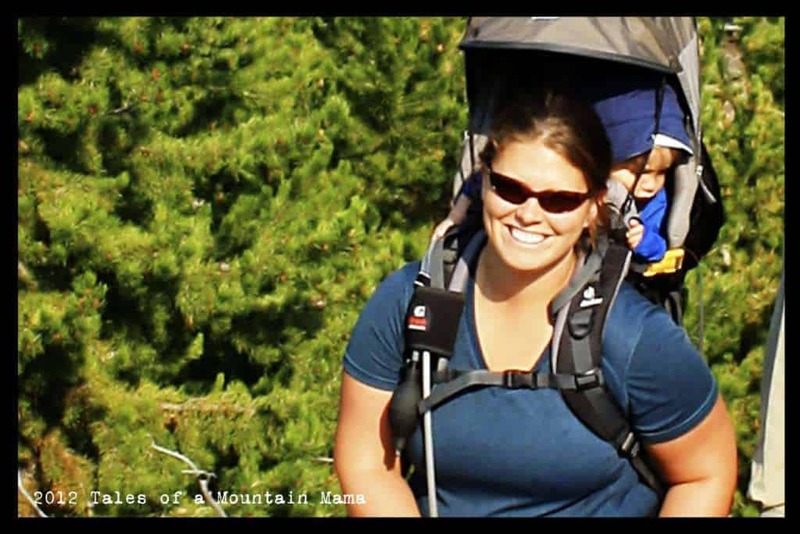 Suspension forks add unnecessary weight and bike weight for children is critical. This is especially important for our young riders. Why would we add additional weight to the bikes when bike weight is one if not the most important factor for our young riders at that age? rider doesn’t even benefit from a shock? The coaster brake is heavier than the freewheel. The bike is just easier to pedal without it. When using coaster brakes, an emergency stop is only possible whenever one of the pedals is positioned at the 1 o ´clock position while riding. This contains significant risks as the child can only perform an emergency stop whenever the pedal is in the right position. In case the pedal is in not in the correct position in an emergency situation, your child might not be able to brake adequately. We’ve seen this be an issue for both of our boys. Introducing the concept of using the break will make their life much easier in the long run and most important of all, much safer. Especially important is the front brake, which delivers the braking power. Learning how to work both brakes is essential for children as they grow up. P (aged 3.5) wants to ride all the trails that his older brother does (go figure). However, until he is proficient using BOTH handbrakes at the same time, we will not let him ride them. The coaster brake is just not safe because it only brakes one wheel. P is very small for his age (he’ll be 4 this summer). 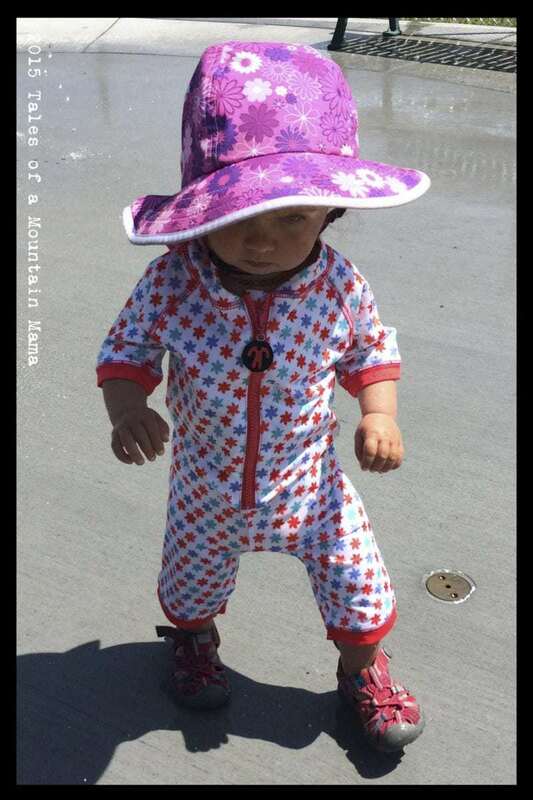 He isn’t even 30 pounds yet and is barely outgrowing size 3T clothing. However, he is easily able to use the handbrakes with no issue of reach at all (see photo below). This is a really really big deal for a small kid with a big sense of adventure and drive! WOOM carries 5 different sizes of bikes. 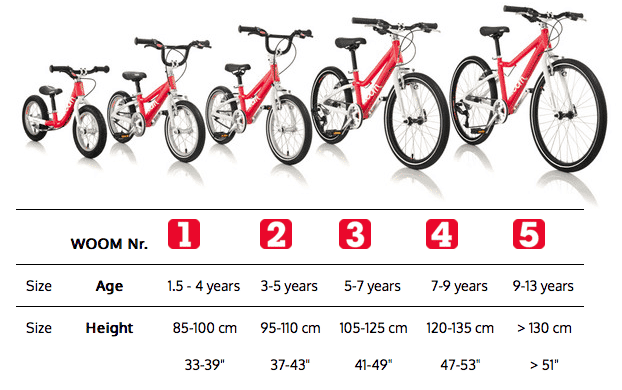 This table shows a rough outline of what ages/sizes of kids should be riding which bikes. The only difference we see is that our (almost) 6 year old easily rides the WOOM4. Also shown on that table is the WOOM Supra. The same size as the WOOM4, the Supra is the best of the best. More on that coming…. Our reviews of the bikes we have had an opportunity to demo are coming shortly. I will also link up to other published reviews below. As is often the case, and is no exception here, you definitely get what you pay for. These bikes are not cheap, but, they are VERY reasonable for the quality of ride they are. While we don’t believe in going into debt for anything, if you can afford them, these bikes are worth every penny. They also have a great UpCycle which allows you to get 40% back on your original bike purchase when you buy the next size up within 24 months. All the details are here. Check back for our review of each individual bike and feel free to ask questions in the comments! Another awesome and very informative review! We are anxiously awaiting the arrival of our new balance bikes for our twins, however, are already researching into the best pedal bike to transition to, once they are ready to move on. Thanks Amelia! I ordered James a Woom 3 last week based on your strong recommendation! Looks amazing! Woom was actually my hubby’s first choice, but we couldn’t ship one here for a good price when we were looking a couple years ago. Looks like they are expanding more in the US and Canada, so that’s great!!! We live in a hilly area, so the kids need lighter bikes! Thanks for this post! We have a three year old Strider rider who just loves to ride. He is small, just barely 30lbs now, and I honestly wasn’t even sure where to start in looking for an appropriate pedal bike for him. Your post was very informative and we will definitely look into Woom Bikes! I loved reading your reviews on Woom bikes. I’ve been drooling over the bikes for my kids since I first read about them on Two Wheeling Tots. Love that they offer bikes w a freewheel option! I am so intrigued with Woom bikes! We bought our son a Strider 2 years ago and it is getting too small for him. I really like the idea of the hand brake vs the coaster brake; it seems much safer. It also means they don’t have to learn a new way to brake when they switch to a bigger bike. Can’t wait to try the hand brake. Perfect way to get them started. I hope to have D riding this fall or at my school in the winter. And 3 for our 5 year old. Wish we had learned of these great bikes sooner! 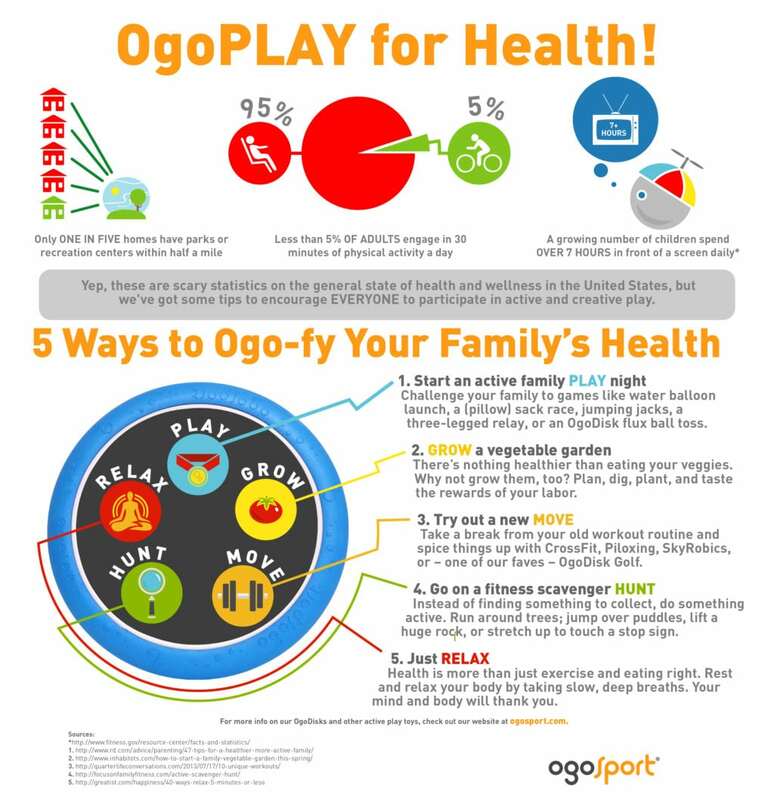 It’s amazing the percentage of body weight that the average kids bike is. I read elsewhere that it’s recommended the bike weight only 3x the child’s body weight. 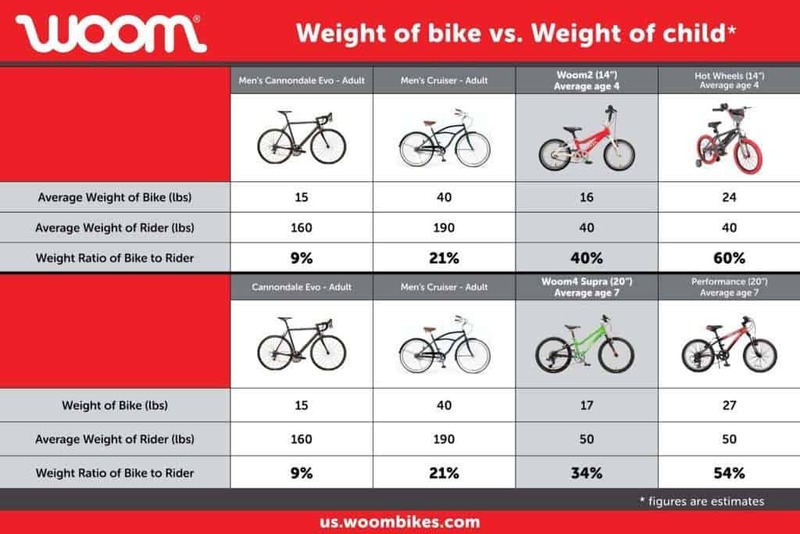 That’s interesting about the bike for because unnecessary and just adding weight, I have been looking into the Woom2 recently for my tiny 4½ year old and all the info here (especially about the freewheel) confirm Woom may likely be what we settle on. Thanks. Hoping to get Kaden a Woom2 or 3 soon! Tried to get a cheaper Strider that was “the next size up”, and not only did it weigh about 2 tons, but the geometry of the bike was such that Kaden had to lean so far forward to reach the handlebars that he couldn’t properly ride. They were literally about as far away from the seat as on an adult bike! We love our Woom1, and it is a perfect example of getting what you pay for! Love that these do not have a coaster brake, and had no idea that shocks were for “show” on kids bikes! 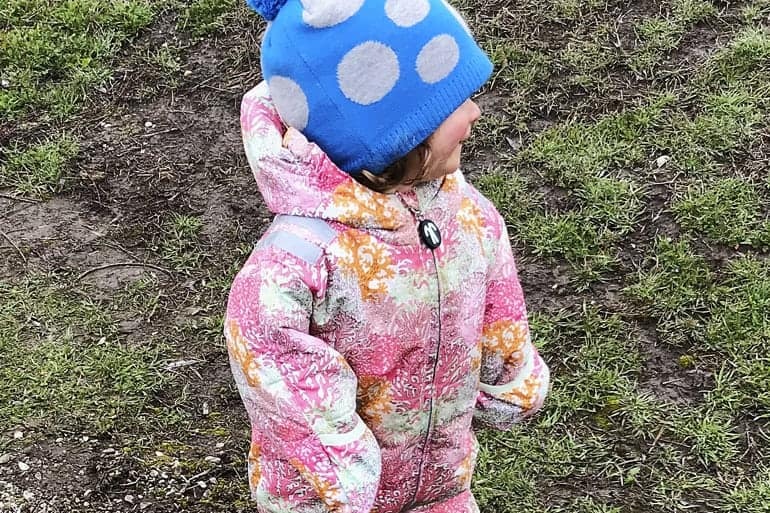 Thanks to you, Amelia, we are total woom fans! Our son rocked his 2 this past year and is stoked to get on his 3 in the next couple of weeks. We got the SRAM (2-speed) and are really looking forward to seeing what our guy can do! Thanks for all the great reviews. I was hoping to get your opinion. My littlest is 5 and a good rider. He has been riding a Hotrock 12 since before 3. We live in a hilly area and bike commute. He needs a bigger bike but he is not that tall. (42″ with an 18.5″ inseam). 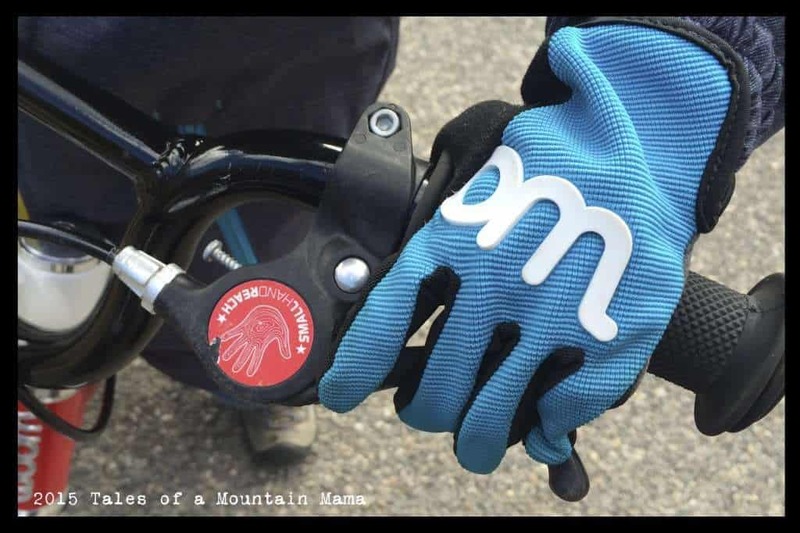 Woom thinks he is still too small for the Woom 4 but Jacob at Prevelo bikes thinks he will fit the Alpha 3. Is there a reason he would fit on one and not the other? Maybe a 16″ is the way to go for now. I live out of the country and am in only once a year in the summer. So it is bike buying time. Your son sounds like mine as far as size, etc. 🙂 And no, the bikes are very similar in size and geometry. WOOM tends to be more conservative and keep kids on bikes longer before pushing them into bikes they may not be ready for. My son is 6, not yet 40 pounds and wearing a size 5t (And sometimes 4t) pants. He rode a pedal bike before 3 also and does just fine on both the WOOM 4 and the Alpha 3. That said, if it’s super hilly and you don’t want the gears, he would probably do better on a 16″ just because he can not be fighting a bigger bike. It kind of depends on your financial position and how aggressive of a rider he is. Does that help at all? Let me know if I can help any more! Thanks for the response. From what you wrote I thought your son was a similar size to mine. Not sure if the gears or smaller lighter bike will be more helpful. He rides the Hotrock everywhere. He loves that is so small and he is in such control. Thinking of ordering the 20 and if it is too big sending back. Hate to buy a 16 inch for one year. Will do. In the States the end of July. Does your son prefer one bike over the other (Woom, Prevelo)? Originally wanted a Supra but they are discontinued :(. Honestly, they are very similar. He tends to gravitate towards the WOOM, though. Also see my response below to Robert if that helps too! The Bike came. Went with the Woom 4 in the end and was starting to worry as when I spoke to Woom on the phone they were convinced he would not be able to ride it. So far so good. :). With the seat all the way down he has more than just tip toes on the floor and can really push off on the ground to start. Yesterday he had the bike in the park and went over every uneven surface he could find, tree stumps and small rocks, trying to test the limits. Glad he didn’t find a stair case yet. :). He has started to play with the gears too. The hand breaks are a bit hard for him to pull. I will have to adjust the reach I think. Noticed that they seem stiffer than biggest sis’s Beinn 24 breaks. Overall great so far. While the bike is maybe a tad big my guy is ok with this. I don’t think this would be a good stretch for a beginning rider. Thanks again for your reviews and thoughts on the matter. Sounds like a winner to me 🙂 So glad it’s working! And yes, worth adjusting the brakes to make them less stiff and the reach too!!! Take it to a bike shop if that helps!!! I’m sorry to say at 18.5″ inseam now, I think he is too short for the Woom4. Mine is 18.5″ standover (right in front of the saddle), but the saddle adds 3″ to that for a minimum saddle height of 21.5″. If your boy likes the feeling of the small bike (although I’m amazed he is still enjoying a 12″ wheel bike at age 5!) then he is definitely not going to enjoy starting on and off the ground (rather than starting from seated in the saddle) and even if he did learn to do that, the 18.5″ standover is really just on the bent part of the crossbar you will notice in the photos. There will be tears when he slides off the saddle! I also have a Cleary Owl (20″ single speed) from Jeff Cleary in California. It is a lovely bike, beautiful components, 19lb and now done over 900 miles on the school run. It is only 17.5″ standover, but again the saddle adds nearly 3″ to that, for a minimum saddle height of 20.5″. My 5 yr old rode that from the first day of kindergarten, but her inseam was definitely more than 18.5″ – I feel like it was exactly 20″ back then. For $80, Woom has it’s upcycling scheme, where they will buy back the bike within 24 months for 40% when you buy the next size up. If you can be bothered with the shipping, an Islabike will have such a huge resale popularity that it might actually be even more cost-effective than that. My neighbor has sold both a 16″ Islabike CNOC 16 and Beinn 20″ in a matter of days for nearly 66% of the new price, on Ebay in the last couple of years. I wouldn’t worry about gears yet – My 6 yr old understands them, but when he was 5 (and his 5 yr old sister now) he didn’t really use them. I’m afraid it’s a 16″ for 1 year for you! I say Woom3 (with upcycle membership) if he wants an upright riding position, an Islabike CNOC 16 (with excellent resale value on Ebay) if you want a more leaning forward position, or a Jeff Cleary Hedgehog 16″ if you want to pay the least but still get lightweight and high quality.